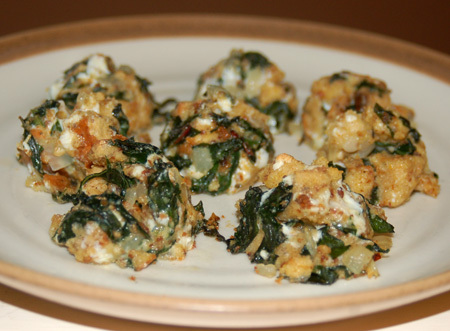 Today I want to share an old family recipe that I loved as a child: spinach balls. Almost more of a stuffing ball than a spinach ball, my mom always used to make this recipe to take to potlucks because they tasted good at room temperature and she knew I would at least have something to eat (not to mention it was one of the few vegetable preparations I accepted). These little nuggets of bread, cheese, and spinach were one of the first foods I ever made for my husband (aside from boxed pasta and clam chowder linguine in the dorm kitchen), and being the bread fiend that Jeremy is, he loved them. I haven’t gone back to most of those old recipes for years, now that we are bona fide foodies, but last night spinach balls sounded like just the ticket to accompany a bowl of salmon chowder on a rainy, fallish day. The original recipe called for a lot of pre-packaged foods—stuffing mix, frozen chopped spinach, pre-shredded cheese—and a shocking amount of butter. I adapted the recipe to be more real-food friendly, starting by drying quarter-inch cubes of leftover flax hamburger buns and sourdough bread heels. This was quick to accomplish in the convection oven over very low heat, especially since my homemade bread doesn’t contain preservatives that artificially extend its softness. I didn’t have quite enough bread to make the full recipe, so I figured it wouldn’t hurt to throw some frozen bread crumbs on the tray and dry those out too. Then I sauteed some sweet onion and garlic in olive oil and threw in a large bunch of washed and chopped organic beet greens, an incredible free score at the farmer’s market—can you believe people pay for bunches of beets and ask for their beautiful greens to be chopped off and discarded? Since they taste just like chard, and chard tastes a lot like spinach with a backbone, I thought these greens would be perfectly suited to the recipe. I wilted them down in a large skillet with the onion over fairly high heat, throwing in a good pinch of salt to help them along, and cooking them until they were bright green and I couldn’t see any more residual moisture. Some eggs, melted butter, seasonings, and a handful of finely chopped mozzarella cheese, and they were ready to go in the oven, with my handy-dandy disher to save my hands from becoming a greasy mess. They were perfect, just like I remembered but better. Nolan was suspicious at first, since he wants his food plain these days (as in, slice of bread), but I strong-armed one bite into his mouth and he proceeded to gobble down at least 4 spinach balls on his own. I think Jeremy had about a dozen, with a bowl of chowder as an afterthought. I thought they were great, with the homemade bread cubes providing a less mushy, sturdier chew than that prepackaged stuffing mix could; I actually might play around with adding a larger percentage of crumbs to fill them out next time. The beet greens stepped up admirably in place of the frozen spinach. If you are a picky eater, or feeding one, fresh greens are the way to go, beet or otherwise: I always used to take umbrage to the stringy texture and stems that always came with frozen spinach, even though it is an inexpensive time-saver. My free organic beet greens didn’t take any longer to stem, chop, rinse and saute than a box of spinach would to thaw in the microwave and get squeezed dry in a towel. This post is linked up with Foodie Friday and Fight Back Friday. I suspect pretty much any vegetable would work in this recipe if you chopped it up finely enough and parcooked it. My mom once made broccoli balls because we were heading for a school potluck (I was in about 3rd grade at the time) and she discovered we had no spinach in the freezer; I was very skeptical even though broccoli was my favorite vegetable, but they tasted good. You could also probably make a larger version of these, more side-dish appropriate than appetizer-sized, by dishing the mixture into a greased muffin tin and cooking it a bit longer, a lot like Rachel Ray’s stuffin’ muffins. Preheat oven to 350F. Saute onion and garlic in a tablespoon of olive oil until translucent; add the greens and half a teaspoon of salt, and cook down over medium high heat until greens are brightly colored and wilted, and any residual moisture from rinsing has cooked off. Remove from the heat and allow to cool briefly. You want to end up with 2-3 C of cooked greens. Dump the cooked greens and all of the remaining ingredients into a large bowl and stir very well to combine. If your bread cubes are especially hard, like mine were, you may want to let the mixture sit for a little while to absorb the moisture and soften up slightly. When ready to cook, roll the mixture into 2-tablespoon balls with your hands (or use an appropriately sized disher, which is sooo handy ). Place on greased or silpatted cookie sheets—close together is fine—and bake at 350F for 15 minutes, until set. Don’t overbake or they will dry out. Mmmmm. I remember these from my younger years – and they are still good – have really stood the test of time. Good recipes never go out of vogue. Thanks for sharing!! What a great way to get some greens in – I know I would love them! I freeze my own greens so this would be great in the winter for us!! I’ve never had anything like these, but they sound delicious. I can’t wait to try them! Cindy, I agree! No one else I know has ever tried them—time for a comeback! Christy, they were the only way I would eat greens as a child. 🙂 They’re great when you have an extra loaf of bread going stale on the counter too… Hey, that sounds familiar—must be time for another batch! Magic of Spice and KristenM, give the recipe a try and let me know what you think!